Bay and Bow Windows: What’s the Difference? If you’re looking for replacement windows that can dramatically boost your home’s curb appeal, let in lots of natural light, and have some extra useable space – all without changing anything structurally – then consider bay or bow windows. While being two distinct window designs, the terms “bay” and “bow” are often used interchangeably, and in this blog, Kroll Construction would like to set the record straight. Both windows belong to a category called projection windows. These are basically combinations of multiple windows arranged in a way that it projects outwards, forming a bay space, hence the name. The bay space is typically used as a seat, but depending on how the bottom part is constructed, it can also be used as a hidden storage space, an open shelf or an extension of the useable floor space. The main difference between the two is in the shape the combined windows form. Bay windows are angular, with one window at each side flanking one or two main windows. The projection is typically shaped like a trapezoid, but can also be built as a rectangle, perfect for modern architectural styles. Bow windows, on the other hand, are a combination of equal-sized windows that form a graceful, circular shape and look great on traditional homes. Window companies like us recommend bay windows because of its unique benefits. The multiple-window configuration allows effective ventilation, as well as an increased amount of natural light. We’ve mentioned that the bay space that can be configured as additional seating and storage. If your project includes taking out a part of the wall and extending the floor area, you can use the additional space as a kitchen breakfast nook, or perhaps a cozy home office. Bay and bow windows also help boost your home’s curb appeal, as the protruding window actually makes your exteriors look bigger. You can choose any window combination that fits your style. For instance, bay windows with a large main picture window, flanked by casement windows, let you capture a beautiful view and allow natural light, while having available ventilation when needed. 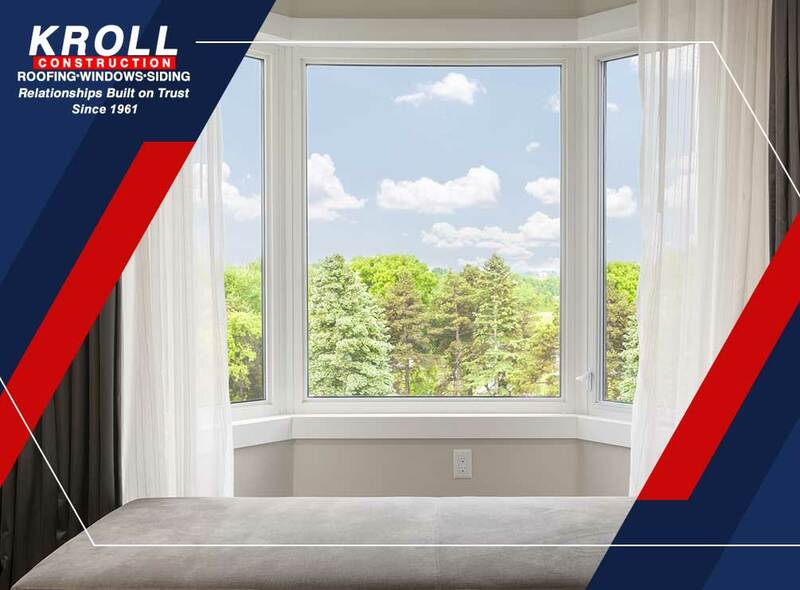 To learn more about bay and bow windows, along with other window replacement options, call Kroll Construction today at (888) 338-6304. You can also fill out our contact form to schedule a free in-home consultation. We serve Michigan and surrounding areas.